Okay, so spaghetti is not Greek, but think of this as kind of a fusion dish. A really delicious fusion dish. 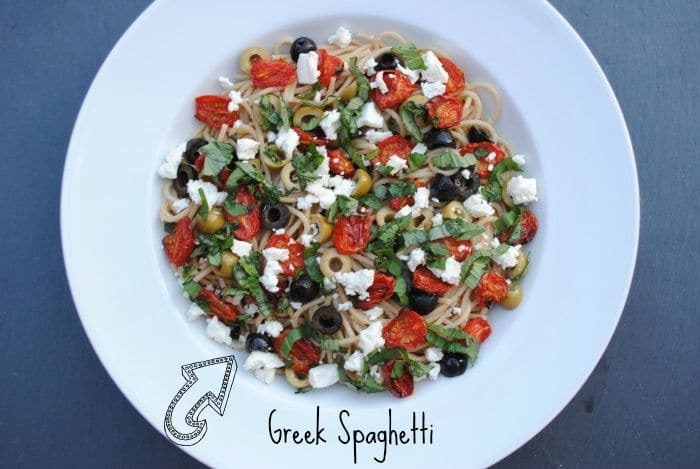 Roasted tomatoes, feta and olives are 3 of my favourite foods, so I thought “why not throw them all on top of some spaghetti with a fresh lemon dressing”. Which is exactly what I did. The perfect light dinner to serve on a warm summer evening. If you want to add some meat to this, then my roasted lemon and rosemary chicken goes perfectly with it. Alternatively, if you want to make this vegan – just leave out the cheese and add in some beans for protein. But I think a little bit of feta goes a long way in this dish. If you are not a fan of pasta, or just trying to cut back on it, have you tried using courgette (zuchinni) instead? Trust me, it makes a great substitute. You can buy special spiraliser machines, but I bought a really cheap julienne peeler from Amazon and I use that on a courgette to make “spaghetti”. I make my pasta dishes with half spaghetti and half courgette (I cook them the same) and I really can’t taste the difference. The great thing about that is that I am getting extra vegetables in to my meal, and halving the pasta at the same time, but still having the taste of pasta in the dish. Win-Win! You can also use carrots, parsnips, aubergine (eggplant) the same way too. Another tip for cutting back on pasta is to bulk it out with spinach. I cook half the spaghetti that I usually would and about 3 minutes before it is finished cooking, I throw LOADS (and I mean loads, you know how much it shrinks) in to the pan and then serve it up how I usually would. Again, extra veggies and half the pasta. 1) Put the tomatoes on a baking sheet and spray with a tiny bit of oil. Put in a preheated oven at 200C/390F for 45 minutes. 2) 15 minutes before the tomatoes are cooked, boil some water in a pan and add the spaghetti and simmer until cooked. 3) Drain the spaghetti and add the lemon juice and zest, garlic and salt and pepper and stir well. 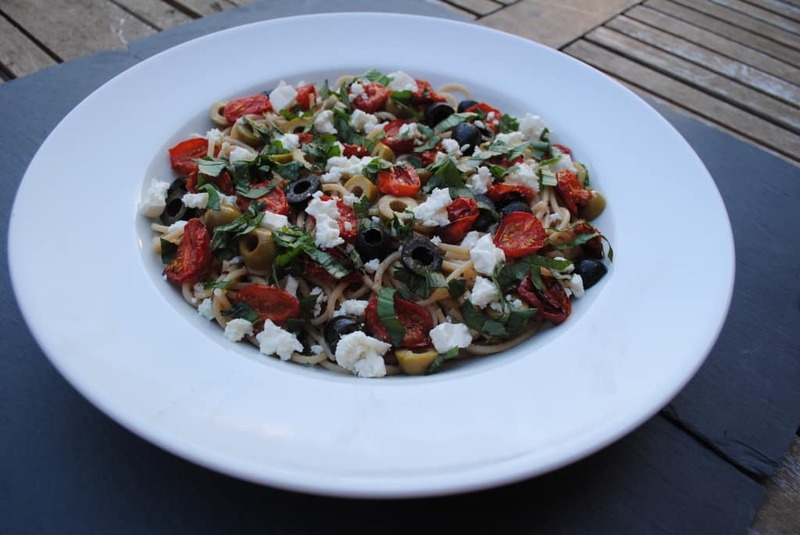 Add to a serving bowl and top with the tomatoes, olives, feta and basil. Serve with a large green salad. Do you have a favourite fusion food? Got any recipe requests? Leave a comment below. 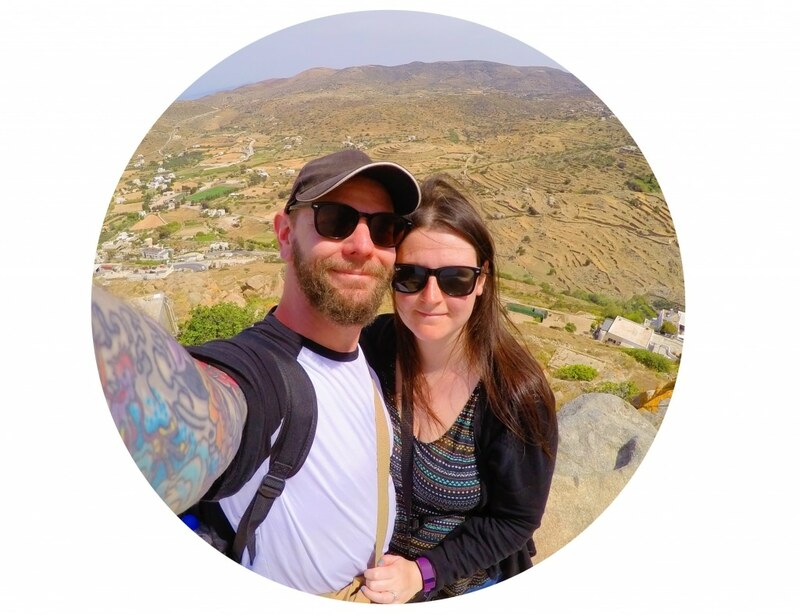 Looking for some more Greek inspired recipes? Wow, they wouldn’t last long in our house haha.